Warrenpoint moved off the bottom of the Irish Premiership for the first time this season by beating Carrick Rangers 1-0 at Seaview on Friday night. Conor McDonald scored the only goal of the game with a 49th-minute header. Carrick had Glenn Taggart shown a straight red card four minutes later for a challenge on Johnny McMurray. Barry Gray's side move two points clear of their basement rivals thanks to five wins in their last six matches, but Carrick have two games in hand. In the first half, Miguel Chines was through on goal but was denied by a fine save from Jonathan Parr. Martin Murray shot into the sidenetting for Warrenpoint and Stephen Murray was denied by the feet of Brian Neeson. McDonald broke the deadlock early in the second period when he headed in from close range after Martin Murray's effort cannoned off the post. Substitute John McGuigan blazed over when well placed to score and then brought an impressive stop from Neeson. Late in the game, Ben Roy squandered a good chance for an equaliser when he shot wide, while at the other end of the pitch, Stephen Murray's tame left-foot shot was off-target. Warrenpoint manager Barry Gray: "I am relieved to get the three points as it wasn't one of our better performances, but the boys ground out the result. "It's nice to get off the bottom but there's lots more work to do to make sure we stay off it. "We didn't control or manage the game as we should when Carrick went down to 10 men. The players knew the importance of the game and it was a bit of a stressful finish, although we created a few chances near the end." 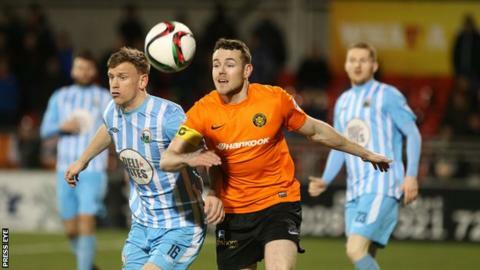 Carrick Rangers manager Gary Haveron: "I thought we were the better side in the first half. The goal we conceded was criminal and it cost us." "I thought Glenn (Taggart) won the ball clean as a whistle. It was a hard but fair tackle. He caught the player after but it is a contact sport. It appears tackling is being taken out of the game."